Have you ever struggled to keep track of the work of your students in a meaningful way. Having their work right in front of you could mean the difference between the student passing or failing your class. 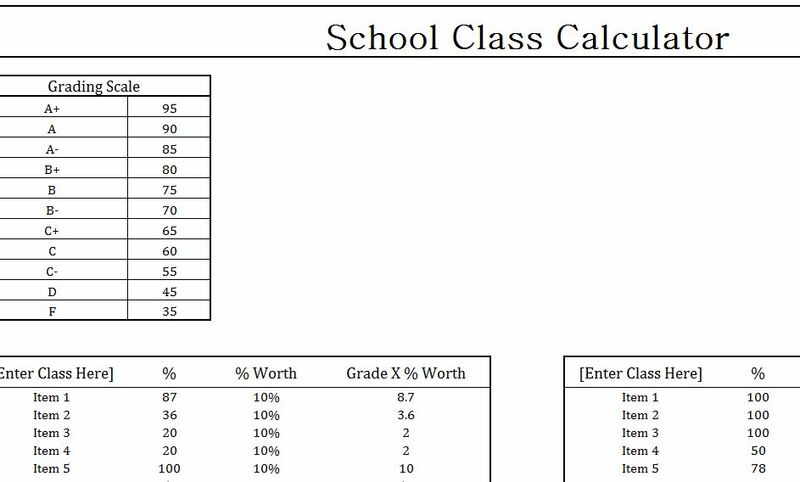 The Class Grade Calculator is a free template that allows you to customize the document and store important student information such as grades and averages. You can use this information to better help them where they struggle and ensure they have a bright future with your guidance. The free template is readily available for anyone willing to give it a try, just read the list of instructions below. Start by downloading the free Class Grade Calculator file directly to your computer. To do this, just follow the link at the bottom of this page to download the free file. Now, open the document and take a look at how it’s structured. At the top, you will set the parameters of different letter grades for your class. After that, you can see that each table represents an individual student. You can copy the tab at the bottom if you need more student boxes, but pay attention to how to fill out the ones already given. There will be 4 main columns in each table. The first allows you to enter a specific item for your class (test, quiz, homework, etc.). The next section is for listing the percentage that particular item was worth. You can also list the percentage of that item worth in relation to the entire class grade. The template will automatically calculate the items total worth in the last column of the template. You can then move down to the next row and keep filling out this information with each new assignment. Using this template, you will be able to identify any problem areas that students seem to struggle with and immediately help them with it.